There are 2 vertical segments on both sides and 3 horizontal segments in the center. What's the largest number you can form, where it has the same number of visible segments as the number it represents. For example 4 is formed with 4 visible segments on a digital clock. Or 5 which has 5 visible segments. How large can these numbers get, and which is the largest? Your answer is only valid if you state the answer, and how you came to the conclusion! There's two answers here: a real answer, and a (slightly) cheating answer. 6 is the largest number where it represents the number of segments. First, we can put an upper bound on our answer. At most, we have a two digit number. This is because the smallest three digit number (100) is an order of magnitude more than the maximum number of displayed segments ($21 = 7\times3$). Through a process of elimination, we can work backwards from the largest possible 2 digit number: 14 ($=7\times2$). We end up with $6$ being the largest number. If we can front-pad the number with zeros, we can get to infinity, but only certain numbers. This is because each zero we add in front of the number is 6 additional segments. For example, $0...0400$ can be made with 114 leading zeros. $(114+2)\times6+4 = 400$. In fact, there's a limited set of numbers that answer this. We know these numbers are greater than six, and we know their remainder when divided by six is equal to the sum of their segments mod 6. Let $N$ be the number, and $s_n$ be the number of segments of the $n$th digit. Any number of the form $0...06...6$ will work (assuming enough zeros). Also, any number of the form $0...040...0$. $N$ is even, iff $\sum s_n$ is even. This is because zero has an even number of segments, and you can't add even numbers together to get odd numbers. The corollary to this is: $N$ is odd, iff $\sum s_n$ is odd. This may seem really obvious, but it helps tremendously. There are probably many other forms. I'd be interested to see a mathematician work through them all. I suppose this is also cheating? This assumes you cannot null-pad the number, since if you can null-pad it, the highest number is infinite. For a n-digit number, the maximum number of lines visible is 7n. Therefore, the number cannot be greater than 2 digits, since 21<100 for n = 3, and the number of lines increases linearly with n while the number increases exponentially with n.
The 2-digit number also cannot be greater than 14, since the maximum number of visible lines is 14. (actualValue-lineCount)%6 == 0 will work. binary. It reads 100000, which uses 3210 line segments to display the number 3210.
in any base, when we add an additional nth digit, the clock face value grows geometrically by (radix*n) while the line count grows arithmetically by at most 7. Clearly these values will diverge quickly; to maximize the point before they diverge, we want the most digits, and hence the lowest radix. Ergo, no base higher than 2 will yield a higher answer. "What about a clock in base square root of two?" Regarding only the maximum of 28 elements and 4 numbers, the highest element is 6 (without leading zeroes) and 22 (with leading zeroes : 00:22). Only regarding decimal system. Since this is a digital clock, the leftmost digit only has six elements, which can display either 1 or 2. 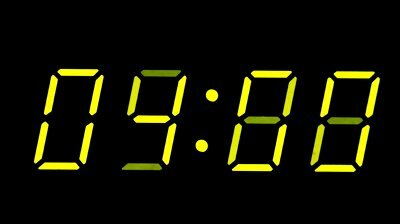 The upper left vertical segment is missing on clock displays. Therefore, the leftmost digit can only display 1, 2, 3, or 7. The lack of facility to display a 0 in the most significant position in a digital clock means the question as asked has no valid answer. Oh sure, 24-hour clocks. Pff. Who has them? Taking a four-gang seven-segment display, with zero padding, the total number of segments is 28. With zero padding (not disqualified by the questioner) this means 0022 (6+6+5+5) is the highest number. Taking a four-gang seven-segment display, with zero padding and a colon (as illustrated, although the missing segment in the second digit is a bit off), the total number of elements is 30. The highest number of elements for a display beginning 00:2 displays 00:28 and lights 6+6+2+5+7=26 elements. This means that, with a flashing colon that is lit at 59 seconds and unlit at 0 seconds, a digital clock will display two consecutive "correct" answers at 21 and 22 minutes past midnight. Not the answer you're looking for? Browse other questions tagged mathematics seven-segment or ask your own question.